Rhetorical Question: What is your worth? How valuable are you? Are you valuable? Why or why not? How much? How do you know? D. Be who He made us to be. One day when I was cleaning out our storage shed, I found two, heavy, bronze Abraham Lincoln bookends on the floor in the corner, covered with dust and cobwebs. The bookends are miniature replicas of the Lincoln Memorial in Washington D.C. These bookends have been in my family for years, and they have often been pushed around, mistreated, and left in deplorable conditions. Finally, though, I decided to find out how much the pair was worth—I was tired of these heavy items taking up space (and stubbing my toe against them over the years!). Upon researching I found out that the bookends are a relatively rare set manufactured in 1960 that sell for around $500 or more on eBay. We treat such things with more care, attention, love, and respect—just as God wants us to! with the help of God, the Bible, and each other! Introduction II: Before we get started trying to figure out our value, what we are worth, let’s go to the second most important book God has given us—the dictionary! Question: What does “value” mean? “Worth, merit, or importance: the value of a college education” (www.dictionary.com). Question: Who or what determines your value? Who or what gets to decide what you are worth? 1. Some say your birth determines your identity and value, what class of people/portion of society that you are born into. In other words, those who are born into a lower economic class are not worth nearly as much as those who are born into a higher economic class. They have less potential, less opportunity, and will contribute less with their lives. They are stuck in such a rut and are destined to a lifetime of disadvantage because of their birth status—they simply do not have as important of an identity as other people. The caste system in India is an example of such a belief system. Those who are born into the higher class have better education, more opportunities, and are generally thought to be more valuable than those in the lower class. Additionally, people cannot move up or down the caste ladder—you cannot climb out of the lower levels of society, you cannot alter your identity and value. The people who comprise the lowest level of this caste system are called the “untouchables.” They are the outcasts of society, and are generally not touched, spoken to, or looked at. They are essentially treated as sub-humans—they are considered insignificant (identity) and they are treated as if they have no inherent worth whatsoever (value). that the status in which you are born determines your identity and value? Question: Does anyone know what it was like to be a shepherd in ancient Israel? Response: Shepherds were one of the outcasts of the ancient near-east, they occupied one of the lowest rungs of the social ladder in ancient Israel. No one really aspired to be a shepherd, at least no one in the higher classes with material wealth and solid educations. They were typically uneducated, smelly, and poor. To be a shepherd, then, was to be less valuable and was to be less important than other people. That’s simply how shepherds were looked at—and that’s why they were treated more badly than many other people. Question: Do you think Jesus’ birth—God Himself becoming a human being, a little baby—was one of the most important events in the history of the world, if not the most important event? Question: When something fantastic happens to you, who do you tell first? Response: Exactly—you would tell your best friend, mom, dad, grandparent, teacher, brother or sister, etc. You would share great news with people you love, with people who are very important to you. Question: When Jesus was about to be born, when the most spectacular event in the history of the world was about to happen, who did God the Father tell first? To which group of people did He send His angels to share this great news? Look again at the passage above from Luke. Response: That’s right. God told the shepherds first, the outcasts of society. Question: So what does that tell us about the value of shepherds, at least in the eyes of God? Response: You betcha—the shepherds are important and valuable, just like everyone else. Summary: So God, through the Bible and through His actions, shows us that a person’s identity and value are not determined by their birth, by the social or economic class into which they are born. If that were true, then the LORD would not have honored the shepherds with the first announcement of Jesus’ birth. So please understand, if you or someone you meet does not have a lot of money, does not live in a fancy house, does not live in a prominent neighborhood, if your parents are not college graduates and if you do not go to a fancy school, please know that God loves you just as much as He loves everyone else. He doesn’t care about where we’re born—it doesn’t affect our identity (who we are inherently) or our value (what we’re worth inherently) in any way. So something else must determine our identity and value. Let’s take a look at the second theory the world has come up with. 2. Some say what you do, what you accomplish and achieve, determines your value and worth. Those who accomplish the most, those who do the greatest things, are worth the most. This is why, for the most part, we see movie actors, rock stars, politicians, athletes, and successful business people on the covers of magazines instead of parents, teachers, and nurses. Many of us believe deep down that those people are worth more because of what they have accomplished. Well…interesting. Let’s look at Scripture and see if it teaches us anything about this. H. trusting in, loving, obeying, and following Jesus even though we can’t see Him (yet, that is!). Summary: Jesus can help us do greater miracles like these…but doing them doesn’t make us greater than Jesus, right? Of course not. So clearly, what we do and accomplish does not increase/determine our value and worth. 3. Some say what you own—the possessions you have—determines your value and worth. The more stuff you have—homes, cars, clothes, college degrees, trophies, A’s in school, even friends, etc.—the more your value and worth increases. Question: What does this verse tell us? Response: Jesus was homeless!!! Wow! Summary: So clearly the value and worth of a human being is not determined by what we own, because if this were true, we would be more valuable than Jesus! 4. Finally, some say what you look like—how handsome or pretty you are—determines your value and worth. That’s why, for the most part, the people who are on T.V., in the movies, and on magazine covers are attractive to look at. This is also why many of us—myself included sometimes—get so depressed or sad when we look in the mirror. We have parts of us—or all of us—that don’t look like these “beautiful people,” and we think we have less value, importance, and worth because of it. Question: What do these verses tell us? Answer: That Jesus was not physically attractive by human standards. Summary: God the Father chose to have Jesus be born as an average looking person (on the outside)—maybe even less than average looking! And this did not lower Jesus’ worth or importance, did it? Of course not. So clearly, our value, worth, and importance are not determined by how we look on the outside. Another Opinion—God’s: The Truth—from the Beginning. Summary: We are made in God’s image—God created us similar to Him in many ways. This tells us that we are valuable!!! We’re also valuable because God is the One who made us—just as a car designed by Enzo Ferrari is worth a lot because Ferrari designed it and just as a painting is worth a lot simply because Claude Monet painted it, so too are we worth a lot because God made us. He’s the greatest artist in the history of the universe. He makes artists, for goodness sakes! What someone is willing to pay for something determines its value and worth. 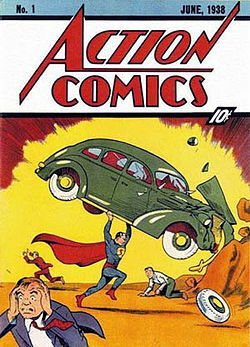 This comic book is valued at $1.3 million. But you can’t go into a car dealership and trade that comic book in for a Ferrari. The comic book might be worth/valued at such a high price, but if no one is willing to give you that much money/cash for it, it’s not really worth that much. It’s only worth what someone is willing to actually pay you for it. Scripture: John 19:28-30 (It is finished = “paid in full”). Jesus paid for us with His life because we were held hostage by sin, the consequences of our bad actions. He wanted to free us, and the cost for us was high. Only His very life—the Son of God—would be accepted to forgive and free us to be friends with God again. That’s the ultimate price, and that is how we know that we are valuable beyond measure. Please click HERE. Listen to the words as they remind you to remember to listen to God’s voice, the voice of Jesus, who tells us that our true value and worth is priceless and comes from Him as our Creator and from Him as our Rescuer and Savior. Jesus said that His sheep listen to His voice—they do not listen to other voices. Let us listen to Jesus’ voice—we have great value and worth, and that value and worth does not rise and fall like the stock market or like a popularity contest in school; that value and worth does not change based on where we were born, what we accomplish, what we own, or what we look like. 1. What does the word “value” mean? 2. Are humans valuable? How much are we worth? How do you know? 3. What are some ways that people mistreat other people? 4. How does today’s lesson change how we should treat people? 5. What are some ways that you can treat people—especially those at home and in school—like masterpieces of God?